The Serra Clubs in the Philadelphia Archdiocese exist for one purpose only – the promotion of vocations to the priesthood. 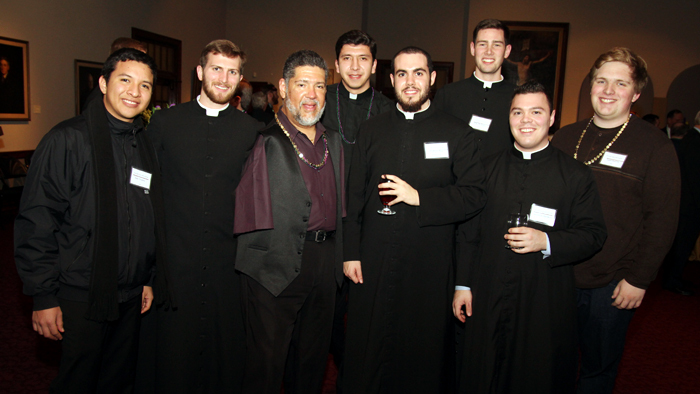 So it was only fitting that their Jan. 30 Mardi Gras Benefit was held at St. Charles Borromeo Seminary, where so many young men have benefitted from their efforts. One of the most tangible ways the Serrans do this is by helping to fund the very successful Quo Vadis summer camp program conducted by the Vocation Office for the Diocesan Priesthood, which as Royal Brown, the president of the Serra Club of Philadelphia observed, has had over 100 participants for each of the past two years. The keynote address for the evening was given by Tony Melendez, a gifted singer and musician who also sang at the benefit and the preceding Mass. Nicaraguan by birth, Melendez, whose repertoire is heavily spiritual, performed three times for the late St. John Paul II and in many countries around the world. 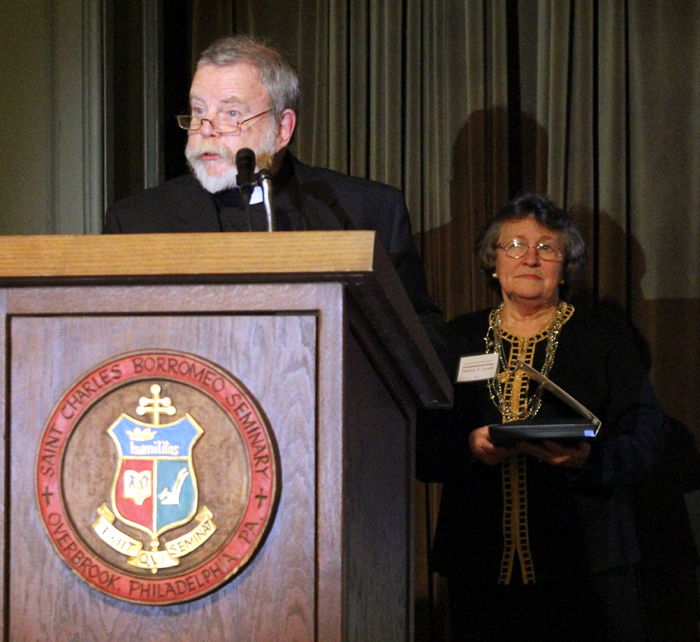 Father William Grogan, pastor of Holy Cross Parish in Philadelphia, accepts the Serra Club award for his father Bill Grogan, a longtime Serran,who died last year. Because his mother was given the drug thalidomide during her pregnancy in a time before the danger of the drug to unborn babies was realized, he was born without arms. In spite of this obvious handicap he learned to play the guitar with his feet, among other skills, and he is a living example of how many obstacles are really challenges that can be overcome by determination. Since the Quo Vadis program will be the beneficiary it was appropriate that past attendees were present. One was Alexander Pancoast, who is in his sixth year and the first theology class at St. Charles. He not only attended Quo Vadis before entrance, he has continued to do so every year since for a total of seven years, encouraging other young men to choose the priesthood. Gabe Fairworth is not yet a seminarian but has been accepted for the next entrance class. He attended Quo Vadis twice and found it a chance to go deeper into his faith. “It was there I discerned and decided this is what I want to do,” he said. Honored at the benefit were former Serran William E. Grogan and Msgr. Michael McCulken. Bill Grogan, who died last year, was a posthumous awardee, and although not a priest it was in his DNA. A father of six, two of his sons became priests as were two of his brothers, three uncles and a nephew. As an active member and officer of DelChester Serra Club he remained an ardent promoter of vocations even in retirement. 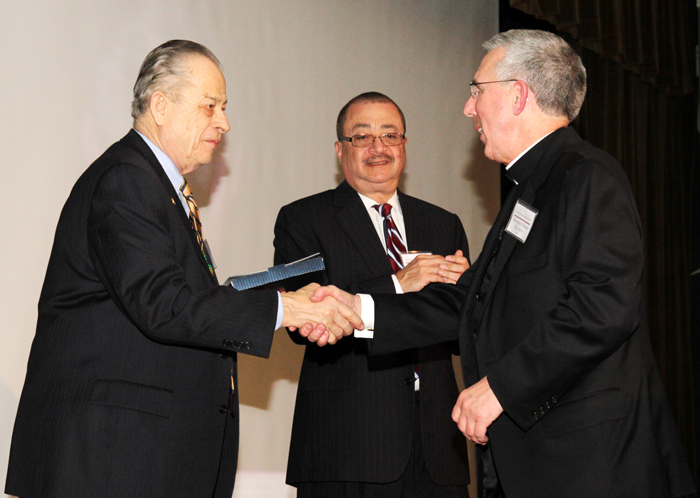 His award was accepted for him by his son, Father William Grogan, pastor of Holy Cross Parish in Philadelphia. Msgr. McCulken, the pastor of St. Eleanor Parish in Collegeville, has held many offices in the archdiocese but was particularly honored for his role in establishing the Vocation Office for the Diocesan Priesthood and becoming first Vocation Director for the Diocesan Priesthood. Clearly a great deal of effort is going into vocation promotion and it is definitely bearing fruit which will show in ordinations down the road. The increase wasn’t just from new men entering in September. At mid-year several new seminarians came in some studying for religious congregations, others for Philadelphia. Most of the increase is really the result of years of Quo Vadis Days and other programs, and continued follow-up that is being done by Vocations Director Father Stephen DeLacy, according to Bishop Senior. “Young men are coming and it is so inspiring. It is a joy to work with them,” he said. Msgr. Michael McCulken (right), pastor of St. Eleanor Parish in Collegeville, receives an award at the Serra Club’s Mardi Gras Benefit held Jan. 30 at St. Charles Borromeo Seminary.